Driving through midnight darkness on the road from the airport down to Jalousie Plantation on St. Lucia was rather like sitting on a gyroscope. I adapted to the constant shift of climbing up hair pin turns glued to the pitches of the legendary peaks of the island, and then of course there was that going down thing. Lost in post air travel dimness I barely noticed the lovely white villa under the Flamboyant tree that would be home for the next week. I disappeared into the most comfortable of beds and snapped off the light wondering at what this intensely vertical terrain must be like by daylight. Seconds later the sun came up. Petit Piton was so close and so alarmingly huge that it consumed the window, filled the sky, stopped my brain in its tracks. Through the white French doors at the foot of my bed I saw an elegant patio with a million blossoms around a charming small plunge pool and what was that beyond? Dripping sunlight glistened on the rainforest soaked trees that clung miraculously to the vertical sides of that impossible peak. I was stupefied by these visions until I found the coffee pot on the terrace and sat down to process where I was. Then I was humbled. I had done my homework and learned that the visionary Lord Glenconner had purchased 492 acres between the pitons in the early ‘80s which included the old Jalousie Plantation, then a producer of Royal Lime. Under his guidance the Jalousie Plantation Resort opened its doors to a festive crowd of celebrities and royalty in the fall of 1993. This is the same Lord Glenconner who purchased a chunk of rock in 1968 which his vision evolved into the playground of the royal and elite known as Mustique. 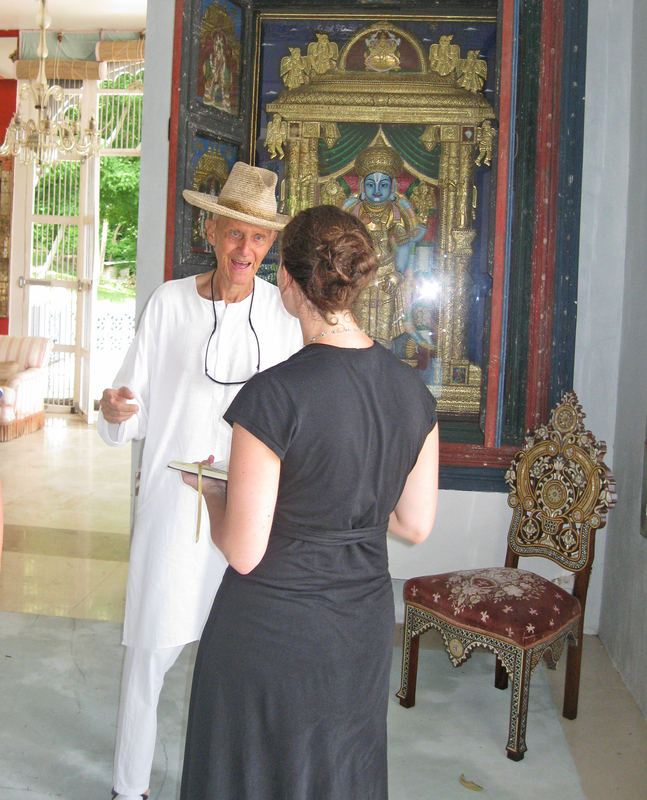 In 2005 the resort on 192 acres was purchased by another experienced visionary, Roger Myers. He has joined forces with KOR/Tides to launch a $100 million regeneration of one of the most beautiful and unique sites on the planet. In so doing he has created a rare opportunity for investors to own part of a UNESCO World Heritage Site. The Tides Sugar Beach Resort project is due for completion in 2011. My cottage, bedroom door on the right, living room on the left, Petit Piton at my back. Pretty Fab! 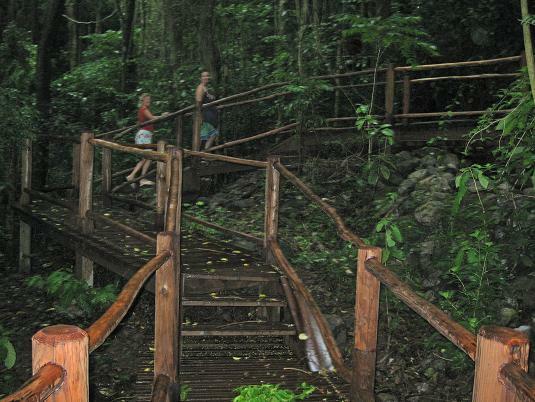 In the mean time Jalousie Plantation is open and glorious to visit. The villas are clean lined and elegant and with a cool white living room, huge bath with claw foot tub, separate shower room with garden access. 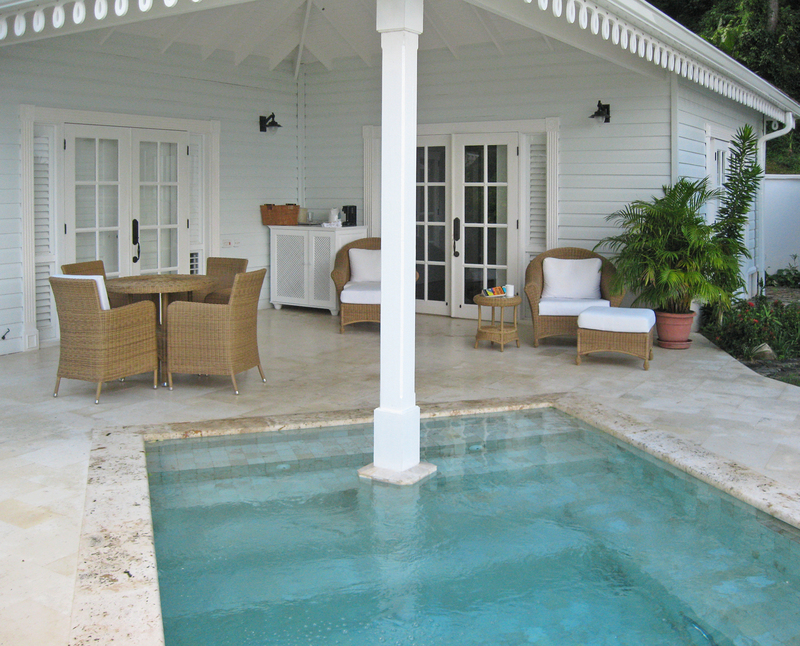 The plunge pool with its flowers, sunny terrace and small bar set up create a lovely laid back way to pay homage to the gods that created the pitons! The food is fresh, local, interesting, and served in three gourmet restaurants with a villa delivery option. Don’t miss the chef’s tasting menu! Jalousie offers to set up tables and serve your dinner anywhere on site so fire up your imagination and create an unforgettable evening! 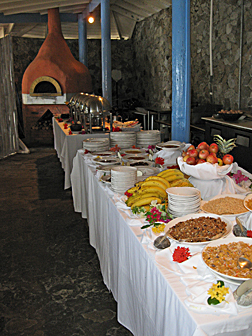 Jalousie Plantation Villas offer 24 hour butler service, a sweet West Indian Spa, a diving center under Petit Piton, the beach club with lounging under the palms, several different lounges inside and out, a children’s club and swimming pools. The list grows as renovation continues creating Tides Sugar Beach Resort. It seems as if every day I was there another inspiration was added to the plan. This very imaginative team of experienced resort creators is focused now on making the most exclusive and elegant complex in history. They intend to blow right by the “5 stars” designation and given the prospectus as designed and this heart-stopping UNESCO site it seems a possibility! Lots of fun aside from the beach…. Meanwhile down the beach, our friend Lord Glenconner is not sitting on his laurels. Owning the rest of le Val des Pitons, he has planned a new village where owners and guests get to meet the locals who will run the restaurants and shops there. I heard about a dock capable of handling super yachts and a new wide sandy beach along the shore with paths for access to Tides Sugar Beach Resort. There are bits of construction going on, but nothing that takes away from the experience of being in such a lush location. 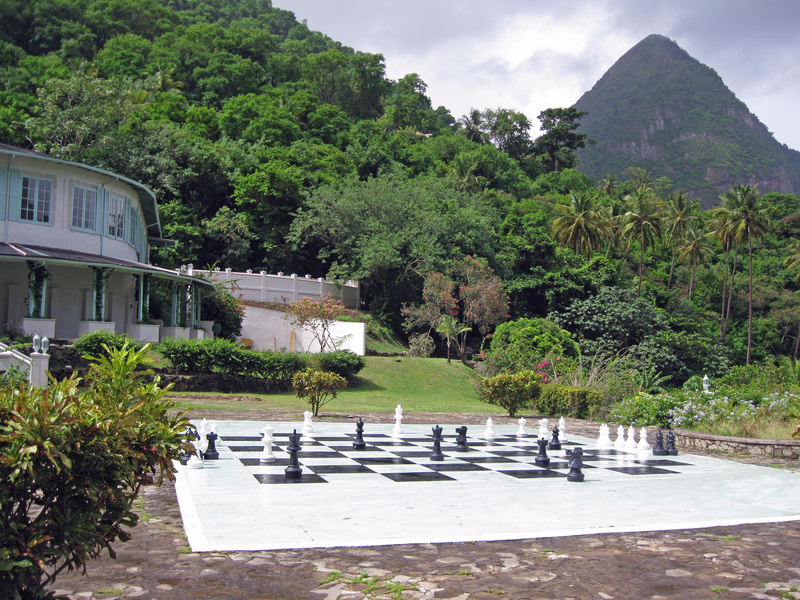 Together Jalousie Plantation, Tides Sugar Beach Resort and Glenconner Village nestled between the famous and unforgettable Pitons of St. Lucia seem destined to leave 5 stars behind to mere mortals. 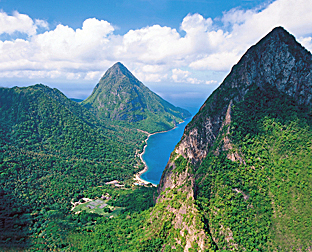 There are two airports on St. Lucia, Hewanorra Int. Airport (UVF) in the south and the George F. L. Charles Airport (SLU) in the north. American Airlines flies direct from Miami daily. US Airways and Delta have staggered schedules in. Jet Blue is starting to service the island. From the UK British Airways and Virgin Atlantic have flights. LIAT offers local flights between the islands. There is a departure tax of EC$68 ($26 US) per adult which is built in to a round trip ticket. A taxi from either airport to Jalousie Plantation is roughly EC $120 ($50 US) for up to 4 people.